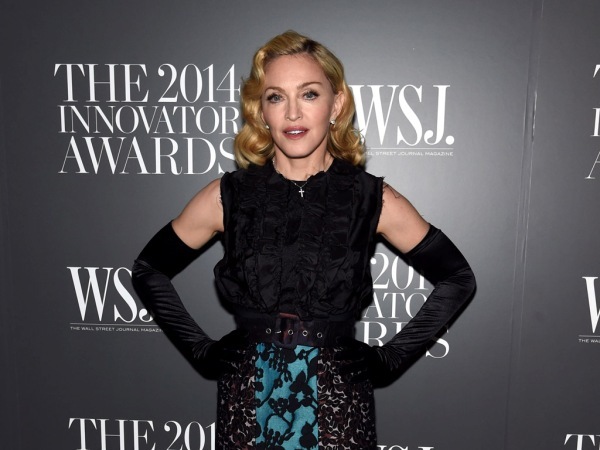 Madonna instituted “applause moments” at the WSJ Innovator of the Year Awards. The ceremony, which WSJ. Magazine hosts annually in honour of groundbreaking talent, took place Wednesday night at the Museum of Modern Art (MoMA) in New York City. Madonna awarded 26-year-old dancer Lil Buck with a trophy at the event and before she presented him with the honour, Page Six reports the pop legend was forced to generate enthusiasm from the audience by commanding them to clap. “I’ll tell you when there are applause moments. You need help. This is a museum crowd,” she is quoted as sighing into the microphone at the beginning of her speech. Since Madonna, 56, split from movie director Guy Ritchie, 46, in 2008, she's been linked to a string of younger men. The songstress enjoyed a three-year romance with dancer Brahim Zaibat before they broke up last year and she called it quits with 26-year-old Dutch dancer Timor Steffens in August after dating since January. Madonna made light of her romantic situation at the podium. “Everybody knows I have an affinity for dancers — a sympathetic nerve, so to speak,” she smiled. Madonna immediately hired Lil Buck as a dancer on her tour after discovering his talents through a contest. Following the Lucky Star hitmaker’s presentation, Lil Buck gave a moving speech and brought the crowd to their feet with a short performance of his dance moves. Dr. Dre and his Beats Electronics partner Jimmy Iovine were acknowledged by rapper Eminem at the Innovator of the Year Awards. “Dre and Jimmy are a force of nature .?.?. They got me to fly here all the way from Detroit to speak publicly. And I really hate public speaking. My palms are sweaty,” the reclusive Slim Shady rapper stated onstage. The WSJ. Magazine event was a star-studded affair attended by celebrities like Karlie Kloss, Doutzen Kroes, Jennifer Connelly and Joan Smalls.